The Usos help welcome back their family member, The Rock. Renee Young brings up WWE NXT Diva Nia Jax and asks what we can expect to see from her. Rock says we can expect someone who’s going to work extremely hard. He says they come from a long, proud line of pro wrestlers and Nia’s #1 thing to do is work hard. He believes she will connect with the people but we’ll see. Find out what the Nia Jax is up to on WWE NXT in the upcoming weeks, by clicking below! NXT Women’s Champion Bayley faces her toughest challenge yet at TakeOver: London, in the form of the powerful Nia Jax. The dangerous newcomer has made it clear since her arrival in NXT that she believes she’s destined for greatness. Now, she’ll have the chance to prove it. Nia, a cousin of The Rock, made an immediate impact upon her NXT debut this past October, demolishing the competition with ease and a sadistic smile on her face. The NXT Universe knew it was just a matter of time before the dominant Diva made a run at the NXT Women’s Title, but they weren’t expecting how it would come to pass. Bayley was concentrating on the challenge of Eva Marie, who quickly befriended the powerful Nia and stacked the deck against Bayley for their Nov. 25 championship showdown. The resilient champion fought through Eva’s best efforts, meddling referees and Nia’s attempts at interference to retain her title. However, the grueling bout gave Nia the opportunity to make a statement, which she took, attacking Bayley from behind and crushing her with two thunderous leg drops. When asked if she was ready to defend her title against Nia, Bayley said she was more than willing. Just seconds later, the powerful challenge crashed Bayley’s interview, recklessly tossing the NXT Women’s Champion through a door. Despite the toll Nia’s brutal beatdowns have taken on her, Bayley has refused to rest, taking on a game Peyton Royce on the Dec. 9 edition of NXT. After Bayley’s victory, Nia emerged to let the NXT Women’s Champion know that there’s nothing she can do to stop her rise to the top. Can Bayley topple the dominant Diva and hang on to her title, or will Nia Jax fulfill her destiny and become NXT Women’s Champion? Find out at NXT TakeOver: London, live on WWE Network Wednesday, Dec. 16 at 3 p.m. ET/12 p.m. PT. Find out what the Nia Jax is up to in the upcoming weeks on WWE NXT, by clicking below! 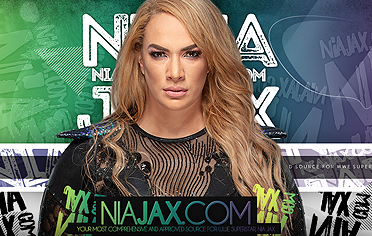 Welcome to NiaJax.com, your Top and Only source for all things on former plus size model and WWE NXT Diva, Nia Jax. Our goal is to provide everyone with the latest news and updates regarding Nia. We have the largest Nia photo gallery on the web, in which we provide various photos of Nia. 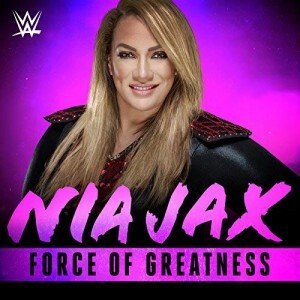 WWE recently released Nia Jax theme song “Force Of Greatness” which is available on ITunes.